Gambit Guide Mega Pack: 1. e4 gambits! Over 61 hours of instruction! 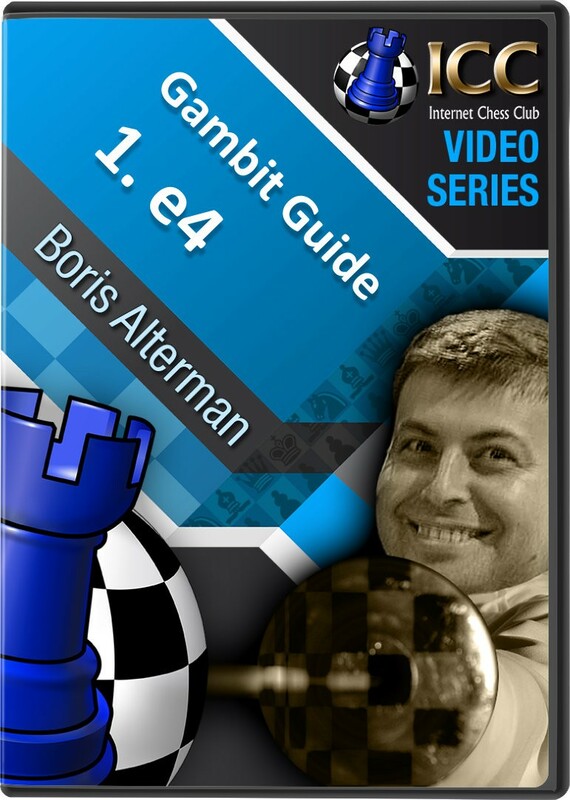 GM Boris Alterman explores the best 1. e4 gambits! How many times have you wondered how to play against one of the many gambits that your opponents use to surprise you in the opening? Now, it's your turn to put your ace down! 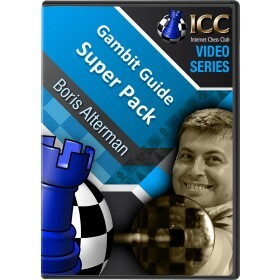 In this Mega Pack, GM Boris Alterman, with his straight and easy style, explains how to master most of the gambit openings you can find out there. Over 61 hours of amazing videos to understand positional, strategical and tactical tricks that will make your opening repertoire stronger than ever! The first Mega Pack has all the 1.e4 gambit openings. When the great "uncrowned king" Akiba Rubinstein introduced the variation that bears his name (1.e4 e5 2.Nf3 Nc6 3.Nc3 Nf6 4.Bb5 Nd4) into praxis at San Sebastian 1912, overnight the formal fearsome Spanish Four Knights, which up until then was a popular opening, went into rapid decline. And now, in the latest series of Gambit Guide, GM Boris Alterman shows why even today this is a good line to have in your arsenal, as the resulting pawn sacrifice allows Black to dominate the centre. The Belgrade Gambit (1 e4 e5 2 Nf3 Nc6 3 Nc3 Nf6 4 d4 exd4 5 Nd5!?) had its heyday in the 1970s, long before the Database deluge. Nowadays, every 'Russian Schoolboy' knows that 5...Be7 is a very effective antidote to this gambit. The main virtue though of obscure gambits, lies in the element of surprise when you play them. And despite not being in vogue, former world champion Anatoly Karpov, writing in his 1988 book The Open Game in Action, heartedly recommends the Belgrade gambit: "...this gambit leads to quite exciting and lively play. I think those who favor stormy complications should include the [Belgrade] gambit in their repertoire." And in a new two-part Gambit Guide series, GM Boris Alterman re-evaluates the Belgrade gambit and suggests, just like Karpov, that it should indeed be included in your repertoire for surprise value alone! Pawns are the soul of chess," once opined the mild-mannered 18th century French musical composer Francois-Andre Philidor, who was also the most famous chess-player of his day. He championed 1. e4 e5 2. Nf3 d6 as an alternative to the more common 2 ...Nc6. The seemingly passive defense went from obscurity to everyone having a closer look in the late 1960s with Bent Larsen's pamphlet, "Why Not the Philidor Defense?" Popular recent books though by GM Tony Kosten, and more lately The Philidor Files by GM Christian Bauer, has seen a revival in the Philidor at club level. And in his latest Gambit Guide series, GM Boris Alterman takes a closer look at the Philidor's Defense, including his main idea of the counter-gambit with 3 ..f5!? The Chatard-Alekhine Attack in the Classical French Defense with 1.e4 e6 2.d4 d5 3.Nc3 Nf6 4.Bg5 Be7 5.e5 Nfd7 6.h4!? is a formidable weapon in the hands of an aggressive player - and only a few years ago, Alexander Morozevich used it to demolish French expert Viktor Korchnoi in just 20 moves! White sacrifices his h-pawn for an immensely dangerous initiative. This leads to the complex struggle, where White has rapid and easy development. Now. in his latest Gambit Guide series, GM Boris Alterman looks at the dangerous Chatard-Alekhine Attack. Boris Alterman explores the Cochrane Gambit against the normally staid Petroff's Defence with 1 e4 e5 2 Nf3 Nf6 3 Nxe5 d6 4 Nxf7!? - an idea that stunned the chess world not only when it was first played in 1848, but also when Veselin Topalov resurrected it again in 1999 against Vladimir Kramnik at Linares. A swashbuckler by nature, 19th-century Scottish master John Cochrane (1798 - 1878) - who is also associated with the confusing naming history of the Scotch Game - was the epitome of the early romantic era of chess, and his legacy lives on through the centuries with his daring tactical idea that survives unrefuted to this day. The Cochrane Gambit involves the sacrifice of a knight as early as move four to lure out the opponent's king in a complex board full of pieces, whilst pushing forward in the center with a mobile armada of pawns. Oskar Cordel (1843-1913) was not so much a top player in Germany but more thought of as a theorists on the game, with many published opening books and magazine articles to his name. Nevertheless, the author did leave a lasting legacy of two variations in the Ruy Lopez he championed: the Cordel variation and the Cordel gambit with 1 e4 e5 2 Nf3 Nc6 3 Bb5 Bc5 4 c3 f5?! The Cordel gambit can lead to some very strange positions and there are many bizarre responses to it - but ultimately it has never proved to be strictly sound, though it is useful as a surprise weapon when you are looking for wild, tactical games. The Cordel gambit has been adopted as such by modern-day grandmasters Ivan Sokolov, Ian Rogers and Jonny Hector. One of the first chess books to be published in Italy, at the height of the Renaissance, was written by the Portuguese master Pedro Damiano back in 1512. In it, he noted that after 1 e4 e5 2 Nf3 the reply 2…Nc6 is good, 2…d6 is not so good, and 2…f6 (the opening named after him) is worst. Many believed for years thereafter that the outright refutation of the Damiano to be 3 Nxe5. However, even today, the Damiano with 2…f6?! retains something of a cult underground following. Even Bobby Fischer played the recommended refutation of it during his legendary simultaneous tour of the US in 1964 and could only draw. The shock value alone of playing the Damiano with 2…f6?! in online play has seen a lot of positive results for Black. And following many requests from ICC members on what to do against it, our resident gambit guru, GM Boris Alterman, overviews it in this Gambit Guide series. The Dashing Danish explores the 19th-century Danish Gambit, first popularized by Danish player Severin From at the Paris tournament of 1867, with 1 e4 e5 2 d4 exd4 3 c3 dxc3 4 Bc4 cxb2 5 Bxb2 - an instant attack favored by swashbuckling masters such as Alekhine, Marshall, Blackburne, and Mieses. You don’t need to be a superstar to receive immortality in the game – all you need is the ability to hitch your name to a popular opening system. One classic case was English amateur correspondence player and humble railway’s clerk Vernon Dilworth (1916-2004), who published analysis in the British magazine “Chess” during the early 1940s that rehabilitated an old line of the Open Lopez. Dilworth became famous overnight after his analysis was spotted by the great Mikhail Botvinnik, who used the tricky line (1.e4 e5 2.Nf3 Nc6 3.Bb5 a6 4.Ba4 Nf6 5.0–0 Nxe4 6.d4 b5 7.Bb3 d5 8.dxe5 Be6 9.c3 Bc5 10.Bc2 0–0 11.Nbd2 Nxf2!?) as a surprise weapon against Vassily Smylsov during the 1943/4 Moscow Championship. And the ‘Dangerous Dilworth’ is not only tricky but still alive and kicking today with many titled players over the years falling victim to it. GM Boris Altermans begins a two video series investigating perhaps one of the soundest of the romantic gambits from the 18th century that is still used at top level in the game today - The Evans Gambit with 1 e4 e5 2 Nf3 Nc6 3 Bc4 Bc5 4 b4!? Captain William Davies Evans was the captain of a sailing packet carrying mail between Milford Haven and Waterford in Great Briton in the 1820s. During one of these crossings the gallant captain suddenly discovered a promising new fourth move for White And so, the Evans Gambit was born coming at the height of the romantic period in the game, the swashbuckling gambit soon took the imagination of the chess world and was adopted by the likes of McDonnell, Labourdonnais, Anderssen, Moprhy, Chigorin and Steinitz. However, despite never being refuted, the gambit went out of fashion at the turn of the 20th Century only to come back in dramatic style in 1995, when Garry Kasparov rehabilitated this venerable old gambit. GM Boris Alterman explores a reliable counter to the King's Gambit with 1.e4 e5 2.f4 d5 3.exd5 e4, the Falkbeer Counter Gambit. Ever since 1850, when Ernst Falkbeer published his analysis, the Falkbeer Counter Gambit has been a theoretically important and reliable system against the King's Gambit. There is a certain spirit in this defense that not only thwarts Whites aims of quick development of the venerable gambit but is complicated by an offer of a pawn on d5. This spirit is consistent with the great attacking play of Anderssen and Morphy and their Falkbeer games can be found in many classic game collections. GM Boris Alterman explores the legendary Fried Liver Attack in the Two Knights Defence with 1 e4 e5 2 Nf3 Nc6 3 Bc4 Nf6 4 Ng5 d5 5 exd5 Nxd5 6 Nxf7!? The Two Knights Defence is one of the trickiest tactical openings around. If White initiates complications with the so-called Fried Liver Attack, play becomes extremely sharp and gambits and counter gambits abound. Anyone who enters the murky waters of the Fried Liver must be well prepared for the mind-boggling complications that ensue. GM Boris Alterman looks at the Goring Gambit, one of the most swashbuckling options for White in the Open Games after 1 e4 e5. It is fun, easy to learn and virtually unavoidable since White can deploy the crafty move order 2 d4 exd4 3 Nf3 Nc6 4 c3 to avoid the Petroff Defense and the Philidor Defense. Even today, the Goring Gambit is still a strong practical weapon where with best play Black achieves no more than equality. However, the lively attacking positions insure that White will have a lot of pressure, even against best play, and a slight error by Black can prove fatal. The Grand Prix Attack with 1 e4 c5 2 Nc3 (followed by 3 f4) was coined by the prominent British chess writer Leonard Barden, because it featured heavily in so many games during the 1970s & 1980s in the British Grand Prix weekend tournament circuit - and especially from David Rumens and GM Mark Hebden; both these players literally devastated the opposition with it en route to many Grand Prix titles. And in his latest Gambit Guide series, GM Boris Alterman takes a closer look at one of the main themes of the Grand Prix Attack, with the pawn sacrifice for White of f4-f5 followed by the launching of an all-out kingside attack. The swashbuckling Swede, GM Jonny Hector, firmly believes that playing chess has to be fun! With his enterprising style of play, he’s often described as “the last of the chess romantics,” with his wild, gambiting approach that certainly wouldn’t have been out of place at the tail-end of the 19th century in the game. Jonny has featured prominently in many past editions of Gambit Guide, and yet again we turn to him for another of his specialities: the Hector Gambit in the Caro-Kann Defense with 1 e4 c6 2 Nc3 d5 3 Nf3 dxe4 4 Ng5 - a truly in-your-face, aggressive system that he’s pioneered, and with excellent results. GM Boris Alterman responds to the many requests from ICC members to delve into very aggressive lines such as the Italian-Koltanowski gambit with 1. e4 e5 2. Nf3 Nc6 3.Bc4 Bc5 4. 0-0 Nf6 5. d4!? It looks like a complete throwback to a bygone romantic age of the 19th-century, but, surprisingly, two Super-GMs were slugging it out with it in the very modern setting of the Corus Wijk aan Zee tournament earlier this year, as Sergey Movsesian dusted off this forgotten variation to beat Michael Adams. Could it be a case of Back to the Future with this vicious line being brought back into praxis? The Jaenisch or Schliemann Gambit in the Ruy Lopez with 3 ...f5 dates back to 1847. This provocative pawn sacrifice by black as early as move three often leads to games of a swashbuckling nature. Black dictates the action from the earliest moment - and often it can confuse the players of the white pieces. It has received a new lease of life with its adoption at elite level by Teimour Radjabov and others. And in his latest Gambit Guide series, GM Boris Alterman takes a closer look at the Jaenisch/Schliemann Gambit. Currently, all eyes in the chess world are focused on the candidates’ matches in Kazan, with one of the eight contestants going forward to challenge world champion Vishy Anand in a title match next year. With so much at stake, players bring their best preparation to the board - and one player in particular, US champion Gata Kamsky, came up with a new gambit idea in the Sicilian Najdorf with 1 e4 c5 2 Nf3 d6 3 d4 cxd4 4 Nxd4 Nf6 5 Nc3 a6 6 a4 Nc6 7 a5!? that our gambit guru, GM Boris Alterman takes a closer look at in a new series. These day's there's not many world championship games ultimately decided on the strength of a gambit for black - but in his quest to become the youngest world champion in 1985, Garry Kasparov refined one as he demolished old foe Anatoly Karpov's Sicilian Szen variation (1. e4 c5 2. Nf3 e6 3. d4 cxd4 4. Nxd4 Nc6 5. Nb5 d6 6. c4 Nf6 7. Nb1c3 a6 8. Na3) with 8...d5!? - a move that totally flummoxed Karpov and his team of analysts'. The idea is simple: You sacrifice the d5 pawn for active piece play. It was thus reborn the 'Kasparov gambit' after Kasparov scored 1.5/2 with the black pieces during that world championship tussle - and the game he won, game 16, is hailed by many to be one of the best-ever world championship games. Since then though, refinements have been found that give White an edge. But in his latest Gambit Guide series, GM Boris Alterman believes that despite this, the Kasparov gambit it is still a good surprise weapon for Black to have in his arsenal. No adventure in chess is complete without deploying a King's Gambit sometime in your career; the history of which is almost as old as the modern game itself. It was first analyzed in Giulio Polerio's sixteenth-century manuscript, reached its zenith in the nineteenth-century when it was almost de riguer, had a brief renaissance during the 1960s thanks to Boris Spassky and David Bronstein, only now becoming unfashionable due to defensive techniques. But now, in this Gambit Guide series, Israeli GM Boris Alterman shows that this romantic of openings can still pack a hefty punch even today for those looking for a surprise weapon at club and tournament level. The Latvian Gambit with 1. e4 e5 2. Nf3 f5!? is one of the most exciting and fascinating openings with a long and storied history in chess literature. The name was a tribute to the Latvian players, notably Karlis Betins (1867-1943), who analyzed it in the early part of the 20th century. Although it is almost impossible to find in the repertoire of a professional player, amateurs, correspondence players and online aficionados here at the ICC have long found the tactical labyrinth of the main lines to be highly appealing. And in his latest Gambit Guide series, GM Boris Alterman puts the Latvian under the microscope. In the venerable Bishop's Opening, the Lewis Gambit, 1 e4 e5 2 Bc4 Bc5 3 d4! ?, named after the 19th-century top English player William Lewis, is witnessing a renaissance of sorts with many new publications, such as Dangerous Weapons 1 e4 e5, and a recent volume of Secrets of Opening Surprises showing that it is still a force to reckon with even in today's modern game. One of the reasons for this is because it offers some tricky transpositions, chiefly to the Max Lange Gambit - with 1 e4 e5 2 Bc4 Bc5 3 d4 Bxd4 4 Nf3 Nc6 5 Nxd4 Nxd4 6 O-O - and it's not clear that Black can avoid getting into known lines. And also getting in on the "exhumation" of the Lewis Gambit is GM Boris Alterman, who takes a closer look at all those transposition tricks in a new series of his Gambit Guide. One of the world’s first Grandmasters, America’s Frank J. Marshall (1877-1944) left behind a lasting legacy to the chess world with his revered gambit against the Ruy Lopez: the Marshall Attack with 1 e4 e5 2 Nf3 Nc6 3 Bb5 a6 4 Ba4 Nf6 5 0-0 Be7 6 Re1 b5 7 Bb3 0-0 8 c3 d5! The myth goes that Marshall deliberately kept his analysis secret for seven years before playing it against Capablanca at New York 1918, but this has since been debunked by historians. Regardless of its origins, it continues to wreck havoc both at club and elite level over 90 years on - and the latest high-profile victim is Ukrainian world No7 Vassily Ivanchuk, who got hit by some stunning new theory in it by Hungary’s Peter Leko at the recently concluded World Team Championship in Ningbo, China. ChessFM’s openings expert, GM Ronen Har-Zvi has comprehensively covered the Marshall Attack during his weekly openings show last year - but in a Gambit Guide special, GM Boris Alterman puts under the microscope Leko’s new novelty in the Marshall Attack that obviously wasn't covered during that particular series. Some openings are so unbalanced that one false move can cost you the game. A prime example being the Max Lange Attack, one of the stormiest opening systems of the 19th century that was named after the German master of the same name, who first suggested it in 1854. And in his latest Gambit Guide series, GM Boris Alterman takes a closer look at the out of vogue Max Lange with 1. e4 e5 2.Nf3 Nc6 3.Bc4 Nf6 4.d4 exd4 5. 0-0 Bc5!? - a position that can be reached by a plethora of openings, such as the Two Knights Defense, Petroff's Defense, Scotch Gambit, Bishop's Opening, Center Game and Giuoco Piano. In volume 10 of the excellent NIC series Secrets of Opening Surprises, Israeli IM Or Cohen's article, "Petroff for Beginners," overviews the mirror-image opening of the Damiano variation with 1 e4 e5 2 Nf3 Nf6 3 Nxe5 Nxe4!? which is reduced to a small note in the ECO, but that can set many pitfalls for white, as black gets a lot more out of the “beginner’s mistake” of copying white’s moves than most players realize. Much of the new pioneering work on the Damiano variation can be attributed to the Austrian IM Friedrich Karl Volkmann, who almost single-handedly has changed the evaluation of many of the key lines once thought to refute the venerable Damiano, so-called as it is similar to the mainline of the Damiano gambit with 1 e4 e5 2 Nf3 f6?! 3 Nxe5 Qe7. In this series of GM Boris Alterman's Gambit Guide, our resident guru on all things gambits takes a closer look at all the new developments in the mainline of the Petroff's Defense Damiano variation with 1 e4 e5 2 Nf3 Nf6 3 Nxe5 Nxe4 4 Qe2 Qe7 5 Qxe4 d6. Ponziani's Opening (1 e4 e5 2 Nf3 Nc6 3 c3) is regarded by many to be something of a relic from a bygone era in the game. Ever since its creator -- Dominico Lorenzo Ponziani -- introduced the opening in the 1760s, it has struggled for survival in tournament praxis. But a new book just published on it, Play the Ponziani (by Dave Taylor & Keith Hayward), could well see more occurrences of this venerable old opening. In the 300 page tome, the authors devote 25 pages to 3 …f5!? - the ultra-sharp option advocated by Ponziani himself, and called in his honor the Ponziani Counter-Gambit. And in a new series of Boris Alterman's Gambit Guide, our gambit guru puts 3 …f5!? to the test. The Riga Variation in the Open Ruy Lopez (1 e4 e5 2 Nf3 Nc6 3 Bb5 a6 4 Ba4 Nf6 5 0-0 Nxe4 6 d4 exd4) was first played during a correspondence match in 1907 between the two cities of Berlin and Riga - and despite many believing it is ultimately unsound, its reputation is better than once thought and new discoveries in it were revealed in NIC YearBook 85 by Correspondence GM Peter Boll. The Riga variation is exciting and often leads to many wild sacrificial gambits galore, where, if White is unsure of what is going on, can easily lead to many a Black quick wins. The Scandinavian or Center Counter with 1 e4 d5 is one of the oldest asymmetric defenses in chess history, dating back to 1475. It became a theory backwater though for many years until it was revitalized and rechristened "the Scandinavian" due to it being adopted by Denmark's Bent Larsen, who defeated World Champion Anatoly Karpov with it. It is now extremely popular at club level, and particularly the line 1 e4 d5 2 exd5 Nf6, the so-called Marshall Gambit (or Scandinavian Gambit) after U.S. Champion Frank Marshall. And in his latest Gambit Guide series, GM Boris Alterman shows how the "Sizzling Scandinavian" can be a potent weapon for Black. A favorite of Gambit Guide is unquestionably the late great David Bronstein (1924-2006), who was nothing short of being a true chess genius. He was an independent thinker at the board, and our gambit guru, GM Boris Alterman has already showed in an earlier series from 2010 how his original ideas almost single-handedly re-invented the King's Indian Defence in the 1950s. Now, in a new series for 2011, he investigates two highly-respected (and typical) Bronstein gambits for rapid development in the Sicilian Moscow variation after 3. Bb5+. First up will be 1. e4 c5 2. Nf3 d6 3. Bb5+ Bd7 4. Bd7 Qd7 5. c4 Qg4?! 6. 0-0! followed by 1. e4 c5 2. Nf3 d6 3. Bb5+ Bd7 4. Bd7 Qd7 5. 0-0 Nc6 6.c3 Nf6 7. d4!? The Sicilian Nimzowitsch (or Nimzo-Rubinstein) variation with 1 e4 c5 2 Nf3 Nf6!? is a relatively rare bird on the chess scene with some saying it’s on the verge of being unsound. But it’s a provocative line with great surprise value; and after 3 e5 often leads to sharp gambit-play that can pack quite a punch to the unwary facing it. In his latest Gambit Guide series, GM Boris Alterman reviews the standing of the variation - and he even includes a look at how not to play it with the now infamous Becerra-Nakamura game recently in the USCL here on ICC, where the US Champion misplayed it to spectacularly lose in just 12 moves! The Smith-Morra Gambit against the Sicilian Defense (1 e4 c5 2 d4 cxd4 3 c3 dxc3 4 Nxc3!?) is perhaps not common in grandmaster chess, but at club level it can be a very potent attacking weapon. The gambit is named after two players, Pierre Morra from France (1900-1969) and Ken Smith (1930-1999) of the Dallas Chess Club, who popularized it to the masses by writing nine books and fifty articles about it. At grandmaster level, the Nge7 variations are seen as best play against it - but at the recent US Open in Orlando, one of the world’s top grandmasters, Loek van Wely of The Netherlands, proved to be the highest-profile victim yet for the Smith-Morra, as he lost in a spectacular attacking game to IM Marc Esserman. Last year, GM Alex Lenderman produced a hugely popular 3-part video series for ICC on the Smith-Morra Gambit (Part 1, Part 2 & Part 3) that received many plaudits - the latest Gambit Guide series, however, will simply update the Nge7 variations in view of van Wely’s horrific loss. If you are looking for swashbuckling gambit play, then look no further than 'The Master of Attack' Rudolph Spielmann (1883-1942), who once said that "A good sacrifice is one that is not necessarily sound but leaves your opponent dazed and confused." Spielmann came up with an almost caveman-like gambit to take on the hypermodern Alekhine's Defense when players tried to transpose into a classical French after 1. e4 Nf6 2. Nc3 d5 3. e5 Nfd7 with 4. e6!? This is a dangerous gambit that gives White easy piece-play and can indeed leave Black dazed and confused, when just the slightest of slips can prove fatal and all roads leading to miniatureville. And in his latest Gambit Guide series, GM Boris Alterman takes a closer look at the Spielmann gambit for White. Books and songs were written about him; and the Tal Memorial now underway in Moscow, the strongest tournament of the year, further reminds us of the legacy of the incomparable genius that was Mikhail Tal. ("finger TalMemorial09"). Tal was also known as "The Magician from Riga" because of his extremely powerful and imaginative attacking style. And back in 1979 (against Englishman IM Bill Hartston), Tal unleashed on the world the “Tal Gambit” with 1 e4 c5 2 f4 d5 3 exd5 Nf6! ; a move that practically overnight put 2 f4 out of business. He only drew the game in question against Hartston - but Tal’s energetic play throughout proved to be a model for how to play against 2 f4 that soon players had to resort to 2 Nc3 first followed then only by f4. . And in a tribute to Tal during his memorial event in Moscow, GM Boris Alterman gives us a timely reminder in his new two-part series of Gambit Guide of why the Tal Gambit is such an effective riposte to 2 f4 in the Sicilian. The "Fantasy Variation" of the Caro-Kann defense in chess, otherwise known as the Tartakower variation, begins with the simple 1 e4 c6 2 d4 d5 3 f3. The idea is to open the f-file with the pawn sacrifice and use rapid development to bring pressure on Black's kingside quickly. It isn't that difficult to learn, resembles the Blackmar-Diemer Gambit in many ways, and often leads to sacrifices and other fireworks not usually associated with the solid Caro-Kann. And in the latest of his Gambut Guide series, GM Boris Alterman takes a closer look at the Fantasy variation. GM Boris Alterman continues to explore the tricky Two Knights Defense, as he moves on to the Traxler (or Wilkes-Barre) counter-attack with 1 e4 e5 2 Nf3 Nc6 3 Bc4 Nf6 4 Ng5 Bc5!? It's named after the Czech priest Karel Traxler, who first played a game in the line in 1890. However, it wasn't until Correspondence World champion Yakov Estrin wrote a famed book on the Two Knights some 80 years later that the main theory of the opening really developed. The idea is to ignore the early attack on f7 with the bold 4...Bc5! ?, as a sacrificial blitz soon ensues. 4. Ng5 in the Two Knight's Defense is an interesting, sharp move that practically wins a pawn by force, but Siegbert Tarrasch called it a "duffer's move". We all know of the swashbuckling Wilkes-Barre Variation, Lolli Variation and the Traxler Counter-gambit that are all part of the sacrificial Fried Liver Attack. In this Gambit Guide series, GM Boris Alterman looks into what is regarded as a more common Black response, attributed to Mikhail Chigorin, the Father of Russian Chess, that eschews all of the complications with 4... d5 5. exd5 Na5. 4. Ng5 in the Two Knight's Defense is an interesting, sharp move that practically wins a pawn by force, but Siegbert Tarrasch called it a "duffer's move". A common response is 4... d5 5. exd5, and we all know of the swashbuckling Wilkes-Barre Variation, Lolli Variation and the sacrificial Fried Liver Attack. But Black usually eschews all this with the main-line counter-gambit with 5...Na5. Now, in his latest Gambit Guide series for Chess.FM, GM Boris Alterman looks into the Morphy Variation with 6 d3, where Paul Morphy, the "pride and sorrow of chess," advocated trying to hang on to the pawn. Can it really be so simple for White to hang on to the pawn, or does Black have sufficient counter-play? GM Boris Alterman explores the exciting Urusov Gambit in the Bishop's Opening with 1.e4 e5 2.Bc4 Nf6 3.d4!, a fertile training ground for those looking to improve their basic understanding of tactics. Documented by Ponziani in the 18th century, this gambit was first analyzed in 1857 by Russian aristocrat Prince Sergei Urusov, a close friend of the chess-playing literary icon Leo Tolstoy, and one of Russia's best players of his day. The gambit was deployed in a number of correspondence games between the two and mentioned in surviving letters in the Tolstoy collection, but alas the games themselves have been lost. It's trick or treat time with a special Halloween edition of Gambit Guide, as GM Boris Alterman investigates the Frankenstein-Dracula variation in the Vienna Opening with 1 e4 e5 2 Nc3 Nf6 3 Bc4 Nxe4 4 Qh5 Nd6 5 Bb3 Nc6 6 Nb5 g6 7 Qf3 f5 8 Qd5 Qe7 9 Nxc7+ Kd8 10 Nxa8 b6. This particular hair-raising exchange sacrifice in the Vienna was given it's ghoulishly gothic title by correspondence guru Tim Harding, who wrote many articles about it during the late 1970s. He explained that it is so-called because it is terrifying for both sides, and, much like those two famous gentleman of the night, has an incredible facility for rising - theory-wise at least - from the grave.